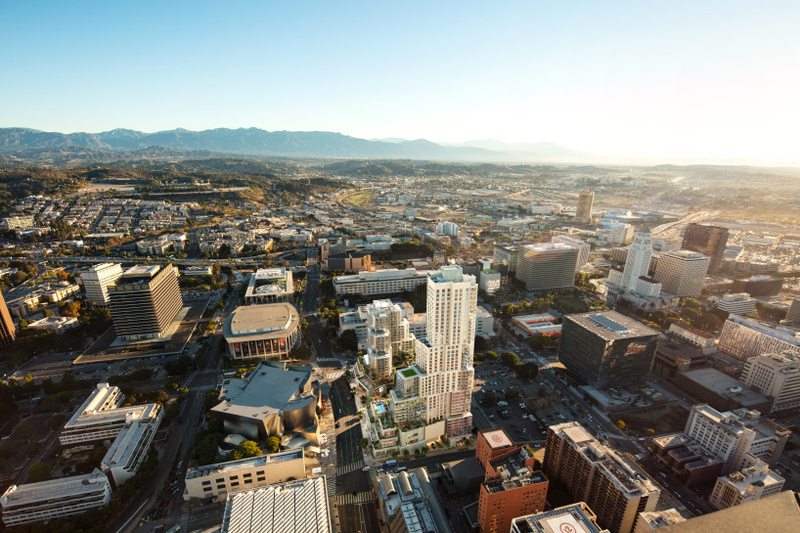 a major mixed-use development by architect frank gehry has broken ground in downtown los angeles. 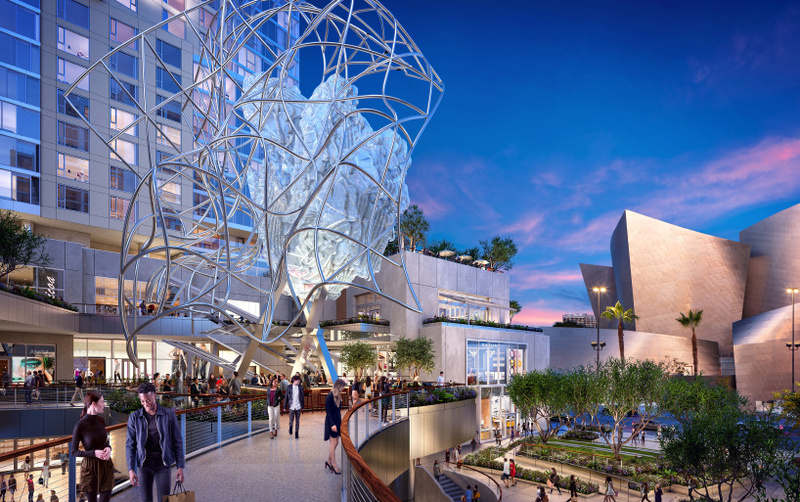 named after its location on LA’s grand avenue, ‘the grand’ is situated in close proximity to the DS+R-designed broad museum and walt disney concert hall, designed by gehry himself. construction is now underway on the project, which, once complete, will bring shops, restaurants, residences, and a new hotel to the neighborhood. 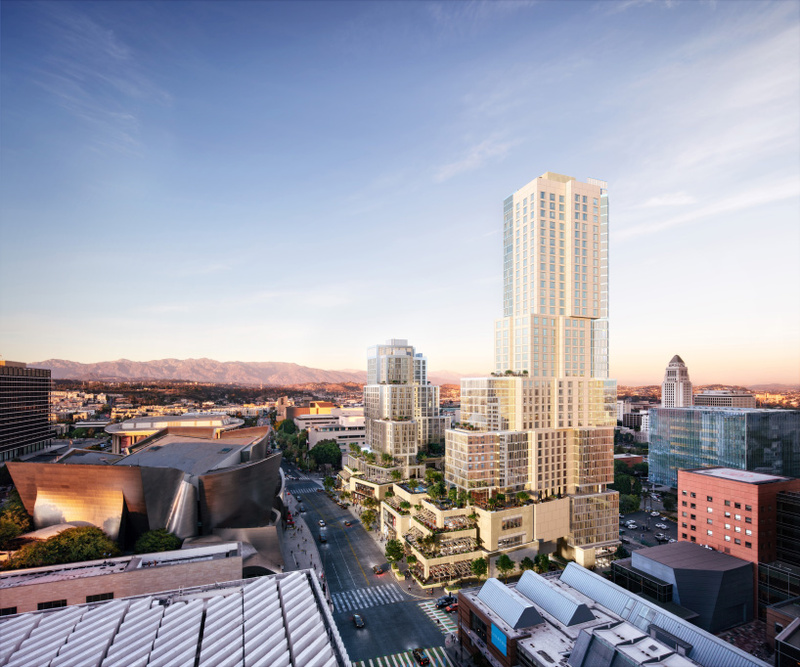 the groundbreaking was celebrated by government officials, philanthropist eli broad, frank gehry, and the downtown los angeles community alongside the project’s developers — related companies and its partner CORE USA. the grand will include over 176,000 square feet of retail space anchored by a collection of restaurants and shops and a movie theater complex. the development will also include an equinox hotel and more than 400 luxury residences, of which 20% will be deemed ‘affordable’. meanwhile, a large public plaza will feature a series of landscaped terraces. the organization of the building massing seeks to break with the typical mixed-use template by integrating podium areas into the overall building design. this allows the towers to meet the ground, surrounding sidewalks with restaurants and humanizing the base of the building for pedestrians. each tower is clearly differentiated in height to modulate the massing and better relate to the surrounding context, while greenery is integrated at all public areas in the lower portion of the scheme. according to the team behind the project, the grand exceeds energy efficiency requirements with high efficiency heating, cooling and hot water systems, LED lighting, energy star equipment and appliances, and smart controls. use of the city’s potable water supply is reduced through significant rainwater collection and reuse for irrigation systems and water efficient fixtures. the grand also offers residents and visitors access to sustainable and unique amenities including EV charging stations, on-demand electric vehicle car sharing, and over 150 bicycle parking spaces. ‘our long-term focus and tenacity of effort ensured frank gehry’s architectural majesty and a destination befitting this great city,’ says stephen m. ross, chairman and founder of related companies. 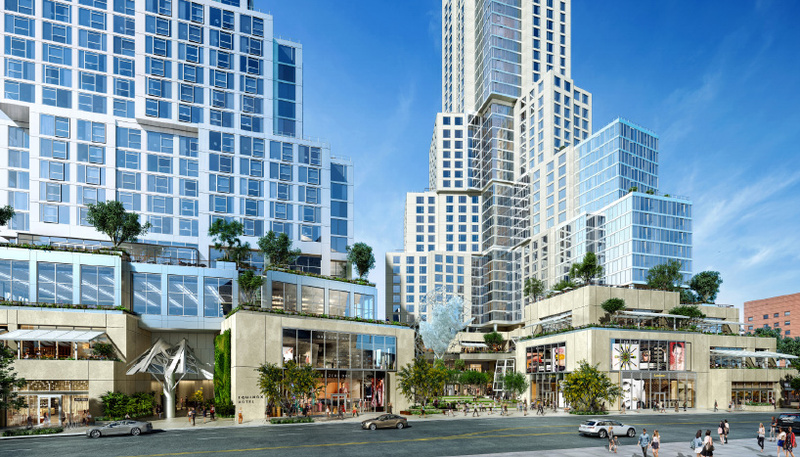 ‘the grand is a crescendo to downtown’s cultural renaissance and will bring not only tremendous economic benefits, but culinary creativity, new shopping and entertainment experiences, a unique hotel and brilliant residences for all income levels.’ it is estimated that the development will generate 10,000 new jobs, $397 million in revenues to the city of los angeles and $68 million in revenues to the county of los angeles over the next 25 years. the grand is expected to complete in 2021. see designboom’s previous coverage of the project here.